A new batch of Blossom Eau de Cologne is now available. This is a traditional cologne based on the classic equation of combining herb with citrus. In November 2005 I decided to create a traditional eau de Cologne which spurred on the Lavender perfume titled Vera. 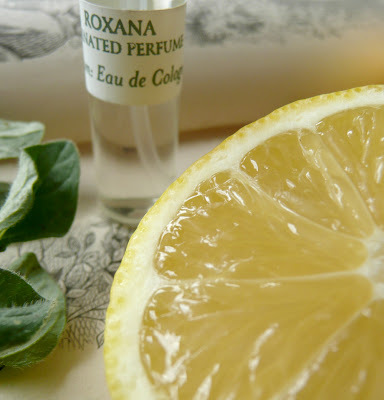 In May 2008 I revisited the genre and formulated a light and fresh eau de Cologne that contains some of the same language of a beloved cologne from Argentina titled Colonia de Bebe and 4711. In fact when my mother inhaled Blossom she exclaimed "Colonia de Bebe!" Blossom has been formulated in the same manner of the colognes of olde. I utilized therapeutic grade essential oils and absolutes, hydrosols, plant tinctures, organic grape and grain alcohol. The fragrance is very fresh like sheer light. The predominant note is Orange Blossom with secondary impressions of herb and wood. 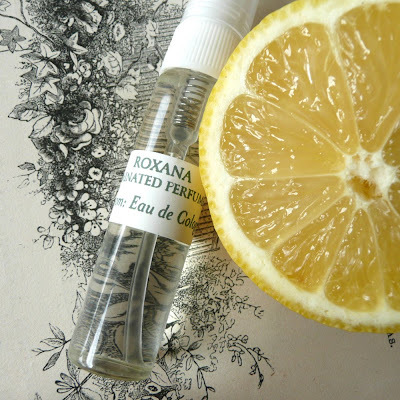 The essences used include: Bergamot, Lemon, Neroli, Thyme, Rosemary, Cistus and Jasmine. This cologne has a refreshing effect on the skin and uplifting to mind, body, spirit. As mentioned above, 5 grams of the cologne are contained in a small glass spritzer bottle with a white top and lid. Perfect for a purse, diaper bag, your pocket, etc. This delightful bouquet is also available in a 1 ounce amber glass bottle. Flowers in Aromatherapy and Morphological systems uplift and blossom open the heart. Hence the name for this cologne Blossom. Hi Aromax, I was just thinking about you! I like your statement: "an elixir that feels you with joy..."
Indeed, it is a very nice citrus refreshment, like lemonade.